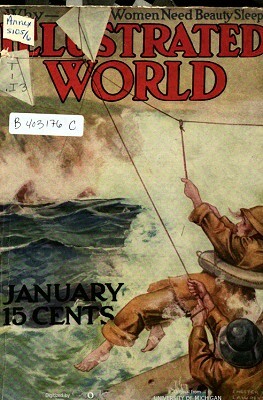 Illustrated World : Inflatable Shark, 1917. Volume 26 Number.5, January 1917. 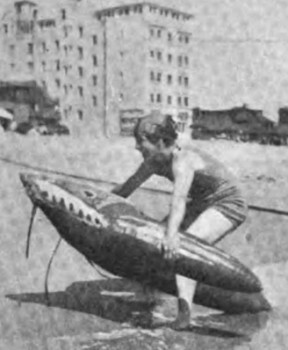 Early inflatable prone craft, shaped and decorated to look like a shark. ​The inflated "shark" shown in a magazine article in last week's Surf Blurb plays an important role in this odd, somewhat incoherent short comedy film from 1916, The Mystery of the Leaping Fish. The inflated shark does not appear until 6:11 minutes, but then is shown abundantly. In this unusually broad comedy for Fairbanks, the acrobatic leading man plays "Coke Ennyday", a cocaine-shooting detective who is a parody of Sherlock Holmes. Fairbanks biographer Jeffrey Vance describes The Mystery of the Leaping Fish as "undoubtedly the most bizarre film Fairbanks made" and that the entire scenario is "a hallucinogenic odyssey into the absurd. Along the coast of Southern California bathers now have a new plaything—a shark. It is a surf-riding contrivance built of heavy canvas and blown up with air like a pneumatic tire. It really is a substitute for the Hawaiian surfboard, a substitute that cannot give the hard knocks so usual formerly. 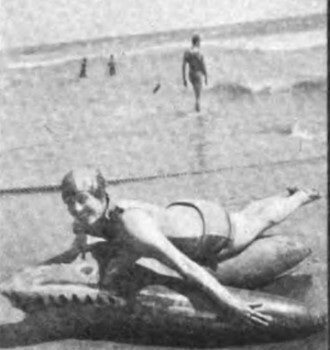 Geoff Cater (2016) : Illustrated World : Inflatable Shark, 1917.